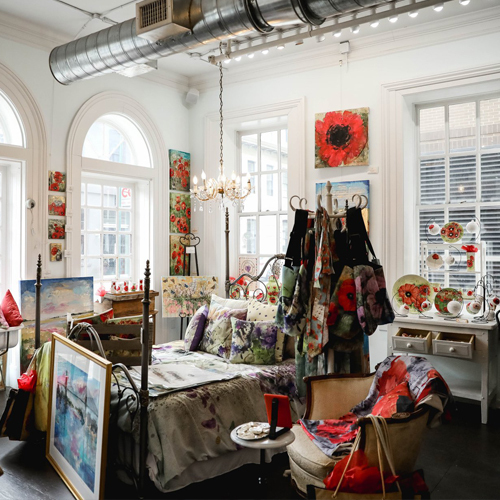 Savannah hosts numerous art galleries of all sizes and types—from paintings and plasters to jewelry and crafts, Savannah has something for everyone. With its rich history and ubiquitous art scene—including the Savannah College of Art and Design (SCAD)—Savannah is a vibrant art hub for all to enjoy. If you find yourself in this great city and longing for a truly unique experience, come visit the Tiffani Taylor Gallery at 11 Whitaker Street, where you can find an eclectic variety of art right in the heart of Savannah. Tiffani always knew art had a special place in her life and was greatly influenced by her grandmother, who taught her to appreciate the aesthetic beauty and natural art of the world around her. Growing up in Ogden, Utah, Tiffani was exposed to this natural beauty and wonder during her youth and still carries an appreciation for it today. Tiffani would eventually make her way to Savannah, GA, where she acquired advanced degrees in Painting and Art History from the Savannah College of Art and Design (SCAD). Falling in love with Savannah and seeking to further her art career, Tiffani was ready to find the perfect place to open her gallery. In 2011, Tiffani’s entrepreneurial spirit lead her to 11 Whitaker Street, where she opened her eponymous gallery right in Savannah’s downtown historic district. The Tiffani Taylor gallery sets itself apart from other art galleries with a truly immersive experience, variety of artists’ works on display and its unique location. Here, you can find something for anything. Tiffani’s gallery offers paintings, prints, pottery, ornate decor and an entire lifestyle collection. 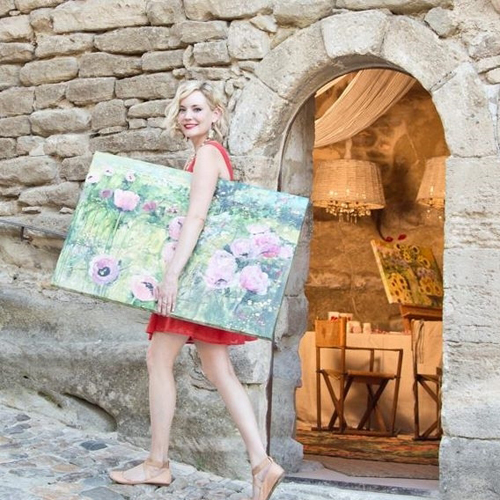 Upon entering, hear the sounds of Parisian cafes, see the natural beauty of Tiffani’s journeys through the Midwest, Southeast and Europe magnificently displayed in her artwork and feel the welcoming appreciation amongst artists and art enthusiasts alike. Tiffani describes her gallery as an artist haven, where people can escape everyday life, discuss art and reflect. Tiffani has gained notoriety internationally, locally with Savannahians & SCAD, and even with notable figures/places, showcasing her work with Vogue’s André Leon Talley, designer Diane von Furstenberg, Pierre Cardin, Oprah Winfrey, SCAD President Paula Wallace, Philanthropy Legend Barbara Tober, The Hilton Savannah Desoto and Memorial Hospital. Visit the Tiffani Taylor Gallery today to meet Tiffani and others, for a truly memorable experience.